After 7 seasons, Bryan Berard is back with the Islanders-maybe. On Monday, Berard's agent confirmed what was already reported in Edmonton newspapers, saying his client accepted an invite to come to Isles training camp. Berard has been having hard luck finding a job, mostly because of his back injuries. Last season, he had 2 surgeries to repair the back and only played in 11 games for the Columbus Blue Jackets. This is a good move in my opinion. In a way, it feels good to see someone who was involved in one of Milbury's worst trades as GM come back, even if it is only on a try out basis. If he's healthy, Berard could make the Islander power play that much, well, powerful. Throughout his entire career, he has put up great offensive numbers. Some have wondered if Berard's eye injury is what created some of the problems for him defensively. But ever since he recovered from that eye injury, even with 20-400 vision in his right eye, Berard has been able to put up some good offensive numbers. I think his bad +/- rating is more attributed to being on bad teams than anything. Of course it is not a given that Berard will make the Isles blueline, one which already includes regulars Brendan Witt, newcomer Andy Sutton, Radek Martinek, Marc-Andre Bergeron, Chris Campoli and Bruno Gervais. Other defensemen in the system who are NHL capable are Aaron Johnson, Freddy Meyer and Matt Spiller. Now add Berard to that, and it could make for a very interesting camp. Add a healthy Berard to that, and he could make this team. Many people are high on both Campoli and Gervais, and even though they both played in 51 games last season one could be sent down for more seasoning. The other could either make the team, be sent down to Bridgeport, or be traded for some help up front. Unless the Isles were getting a good offensive player who is under contract for more than 1 year, I hold on to them. Also keep in mind that Campoli now has a 1 way deal and would have to pass through waivers to get sent down. Gervais is still on his 2-way deal, so he would be a more likely candidate to be sent down. Even with Bergeron on the team, I would see no issue if he were to make it. He would be a perfect QB on the PP, and could dish the puck to Bergeron for the 100+MPH slapshot. Or, Berard could shoot the puck himself, and really keep the opposing teams guessing. After Bergeron arrived last year, even though he put up a point per game with the team, Tom Poti would pass to him more often than not and after a while it became redundant. The Isles have plenty of defensively responsible defenseman where they could pair Bergeron with one and Berard with another for 5 on 5 play. Training camp starts in only 17 days! Yesterday the Islanders unveiled their new look for 2007-2008, introducing the new RBK Edge jerseys that all 30 teams will be using this year. The jerseys are supposed to be more form fitting, which helps cut down on the ability to grab other skaters jerseys and take penalties. Also, the jerseys are supposed to keep the players cooler over a 60 minute game as the fabric is also made to whisk away the sweat. The way the jerseys are made is by using 5 different kinds of fabrics that are all attached together. Most of the jerseys than have been released so far have the thin piping at the top, as you can see from the picture here. Some teams did not make the piping a different color, but many did, just like the Isles have done. 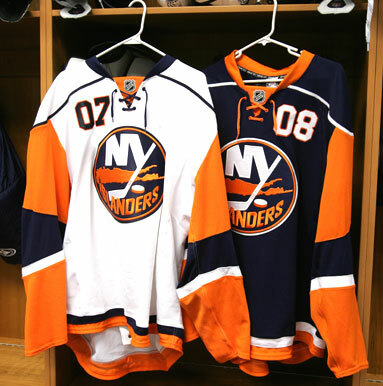 More of what the Isles have done to the jerseys is obviously change the color scheme. 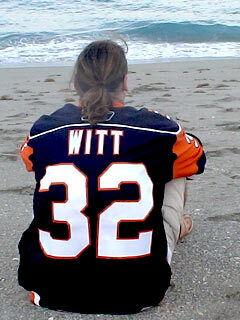 The colors are still navy blue, orange and white, but the look of the jersey is different. The sleeves on both the home and away jerseys are orange with a blue stripe in the middle. On the body of the jersey, there is a number in the top right corner of the jersey. This idea was used by the sabres last year, and some teams might catch on to that. It appears the Isles are the second team to do that thought. 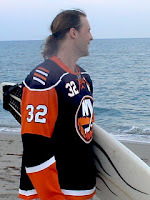 Also on the front of the jersey is the classic Islander's logo, but a bit larger than it used to be. On the neck is the official NHL logo that will be on all jerseys this season. The Isles also chose to go with a bit of an old school look by adding in the ties. On the home jersey, they are orange and on the away jersey, blue. On the back of the jersey, the numbers are a lot larger and look like the ones that were on the Isles jerseys from the dynasty days. On the blue home jerseys, the numbers are white with an orange border on them; the numbers on the sleeves are white as well but with a blue border around them. On the white away jerseys, the numbers will be blue with an orange lining and the sleeves will have the same blue numbers with white lining. On Wednesday the Islanders announced the signed 26 year old center Josef Vasicek to a 1 year, $750,000 contract. There have been rumors since Friday that the Isle's had Vasicek high on their list, even higher than Jason Allison. Vasicek is very happy to be coming to the Island and playing along side his friend Radek Martinek. The 2 are from the same town in the Czech Republic and work out with each other every summer. There has been a glaring need for depth at center and Vasicek definitely helps fill that need. In 63 games last season, Vasicek had 6 goals and 22 points with Carolina and Nashville. With the signing, it appears the team is done adding players. While I have no problem with the contract for Vasicek by any means, I really feel that Allison would have been the much better option. It remains unclear right now weather Vasicek or Sillinger will center the second line come October. I really hope that Vasicek is just here to replace Bates as Josef is an ideal third or fourth line center, but that does not seem likely. I'd still like to make a run at Forsberg if the opportunity arises. If not, well then I'd still like to go after Allison. Either way, we'll have to see if there are any more moves in store for the team. They honestly need another defenseman and a playmaking first or second line center, but the chances of them adding either one of those, if anything at all are slim. On Friday, the Islanders announced the signing of defenseman Andy Sutton to a 3 year deal worth a total of $9 million. Sutton is an 8 year NHL veteran who has always been known for his shot blocking and his size. At 6 foot 6, 245 pounds, there aren't going to be too many people willing to step foot near DiPietro with him and Witt on the ice. Sutton is a definite upgrade over Sean Hill, who left for the Minnesota Wild last month. The fact the Isles were able to sign Sutton for only $3 million per year is a very good deal. On the eve of free-agency, Sutton claimed he was looking for a 4 year deal at $4 million per. As teams passed on that idea, Sutton found himself still available. Although he was easily the best defenseman left on the market, he needed to lower his salary demands and the Isles bit. And it is a good thing too. The Isles were believed to be very interested in defenseman Danny Markov, however recent sources suggest his asking price might have been far too high. Red Wings GM Ken Holland stated that he wanted Markov back, but not at the $4-5 million per year he is seeking. My guess is Markov only wanted a 1 year deal for that money. The Isles made the better decision in signing Sutton for 3 years at a lesser price per year than Markov. Last season, injuries limited Sutton to just 55 games, where he had 2 goals and 16 points and had a +6 rating. Even with all those games missed, Sutton still managed to finish 19th overall in the NHL in blocked shots with 162. 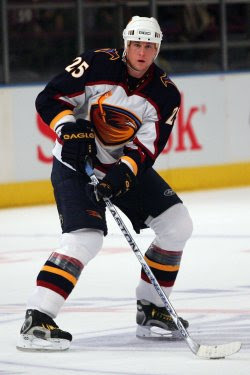 In 76 games in 05-06, Sutton had 8 goals and 17 assists and finished 4th in the league with 195 blocked shots. This is definitely a shot in the arm for the club, and takes a lot of the burden off of Brendan Witt knowing that there is another stay at home type on the blueline. Sutton might even see some power play time if the Isles don't add a defenseman to replace Tom Poti, as he has always put up decent offensive numbers for a stay at home defenseman. The Isles are expecting to add another center very soon, but who that center is remains a mystery. The most likely options appear to be Josef Vasicek or Jason Allison, both who are free agents. Vasicek is a very good 2 way forward, but hasn't really realized his scoring potential yet. Allison has only played in 1 of the 4 seasons, missing time for injuries, the lockout and a messy divorce. Still, in 05-06 Allison put up 60 points in 66 games for the Maple Leafs after missing the previous 2 seasons. Even with all the missed time, I think Allison might be a good option. But, the best, and very unlikely option out there is superstar Peter Forsberg. Throughout his entire career, Forsberg has been the ultimate playmaker and has the hardware to prove it with 2 Olympic gold medals and 2 Stanley Cups. Last season he put up 55 points in 57 games and in 05-06 put up 75 points in just 60 games. While battling through injuries and for the most part playing on just one leg, he was still able to put up spectacular numbers the last 2 seasons. This shows just how much of a franchise center he really is. At 34 years old, he still has a lot left in the tank, and if he proves he's healthy by training camp (which may or may not be the case) then I can see Snow making a pitch for him with all the cap space left over. As I said, this is a bit of a fantasy if anything, so I'd rather look at the trade market before I turn to Allison or Vasicek. Stay tuned over the next week or so as Snow will most likely be adding a center very soon. Trent Hunter was awarded $1.55 million on a one year deal today by the arbitrator that heard his case, and the Islanders have accepted the award. Hunter was looking for something around $1.9 million. It is unclear what the Isles felt he was worth or what they offered him on a long term contract. Either way, Trent will be here for next season at a very fair price for a player who scored 35 points in each of the last 2 seasons. Trent had 20 goals last year, and many hope he is starting to return to the scorer that he was in 03-04 when he seemed to be developing into a 25-25-50 man. I'm very happy to have Trent on the team next season at that price. It is unclear whether the Isles are in danger of losing Hunter to unrestricted free agency next season, but the Isles will worry about that when the time comes. Trent wishes to remain an Islander, so we'll see if something can possibly be worked out in the middle of the season. Today, the Isles and Trent Hunter went to arbitration to determine his salary for next season. The Isles had hoped to sign Hunter long term before the hearing, but both sides were unable to agree. Both sides were fine going to the arbitrator, however, and the decision is expected to be out sometime Friday. Most of the time, arbitrators rule based on stats and not intangibles, so Hunter will most likely get a good salary in terms of his production. Last year, Hunter had 20 goals and 35 pts. Earlier today, Rangers forward Sean Avery was awarded $1.9 by an arbitrator. Avery had 48 points in 84 games for the Rangers and the Kings last year. Some see the Avery award as a comparable figure, and based on the stats Hunter should get below $1.9-probably around $1.2-1.3 million. Recently, Hunter and his agent have talked through the media about the thought of possibly testing the market after next season. If that is the case, then the Isles might want to look at shopping him for some defensive help. I like Hunter very much and still have hopes of seeing him here for many years, but if he is unwilling to show a commitment to the Isles (though there is no evidence of this) then it would be in the best interest of the club to trade him. As the months and the season goes by, we should be able to get a better read on what Hunter's feelings are. Right now he seems intent on testing the market next July. That doesn't mean he can't come back, but 29 other teams will be bidding on him, making the chances not too good. He could also be traded at the deadline if the Isles can figure out his intentions by that time. But as of right now, i expect to see what comes Friday. Hopefully we don't have another case of Mike York on our hands here. There have been no recent rumors for the Isles in terms of adding players. They sound like they are going to still be adding, the real question is when. The latest rumors came about a week ago, when some websites claimed that Snow called LA about Mike Cammalleri and were close to signing defenseman Danny Markov. But since all that news came out, all has been quiet here in Islander country. With arbitration awards being handed out now, and seeing the Edmonton Oilers make some really outrageous offers to RFA's, one has to wonder which route Snow plans on going. My guess is he'll wait till we get closer to training camp, and see which players are the odd men out on other rosters. A move can come at any time. Earlier today, Mike Sillinger was on XM radio and said that the Isles are not done yet, and specifically spoke about the defense. That is good news because the current defensive corps, overall just isn't very good. Sillinger would not say if the move would come by trade or FA signing, but Snow does have some things he is working on. One last note: recently there have been many talks about the Isles new jersey and what it looks like. The word right now is they are waiting until September to release the new designs, but some pictures have been leaked and there are a few different versions of what it will look like. In the near future, we will create a post with links to some of the photos and give you a general idea of what is going on with that.